With its CAN FD satellite interface, Ipetronik introduces a data-logger for traffic and signal measurement. By expanding existing Ipetronik and Caetec data-loggers by four ISO CAN FD inputs, they can be used also for CAN FD network applications. 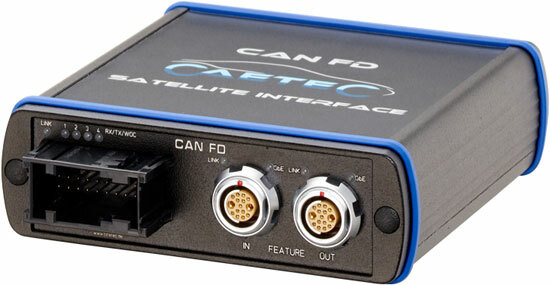 The CAN FD integration is achieved with a connection between satellite unit and data-logger. The introduced product supports the Datalog, Testdrive, and Ipemotion RT data-logger software by the company. It is also compatible with the Arcos 1.5, Ipelog2, and M-LOG V3logger series. The satellite unit transfers data with a bit rate of up to 5 Mbit/s and supports functions such as Wake-on-CAN (WoC) and No-Message-Lost (NML), guaranteeing the storage of all messages from the very beginning. With the integrated GbE switch, several satellites can be cascaded in order to increase the number of CAN FD inputs. Power supply and data transfer are ensured by feature connection (Arcos 1.5) or connection cables (Ipelog2 and M-LOG V3). With a transfer rate of 1 GbE/s (IEEE 802.3), the unit can be connected to the logger via both Ethernet or Gigabit Ethernet input. With an IP40-certified casing of 109 mm x 35 mm x 130 mm, the CAN FD satellite interface supports temperatures of -40 °C to +85 °C at a relative humidity of 5 % to 95 %. A 6-VDC to 36-VDC voltage supply is needed. The standard power input is 2,0 W. The satellite unit can be configured with the Phoenix software or Ipemotion via the Ethernet interface. Two 15-pin connectors and a multi-socket connector are available.